Deep Purple Mk 4 is perhaps the most frustrating incarnation of the band. Together for less than a year, they quickly produced a wonderfully energetic studio album that opened up all sorts of new horizons, then imploded during their one and only World tour. Considering the magnitude of the shock of Ritchie Blackmore's departure in April 1975, the band were very quickly on the case to find a replacement. American guitarist Tommy Bolin took the role in June 1975 after having connected musically during his first audition. The renewed vigour carried over into the rehearsal studio in July (recordings of which survived and were later released as 'Days May Come'), through to the resulting 'Come Taste The Band' album, which showcased Bolin's tremendous writing and playing, especially his unerring gift for welding together rock, jazz, and funk. June : Tommy Bolin is confirmed as Purple's new guitarist. November 7th : Release of 'Come Taste The Band' album. December 15th : Mk 4's final Japanese show, Tokyo Budokan. March 15th : The final 1968-76 Deep Purple show, Liverpool Empire Theatre. July : The break up of Deep Purple is finally made public. The album received a mixed critical reception, but the opportunity to drive it home to Deep Purple fans worldwide was sadly blown when the band went on the road later in the year. Controlling Glenn Hughes' growing cocaine habit was problem enough, but it was multiplied when Bolin's previously hidden heroin use manifested itself. Although a lot of the new album featured successfully in the new live set, incongruous islands of older Mk2 and Mk3 material caused friction in the band, being fundamentally unsuited to the unsympathetically loose performances foisted upon them at times by Hughes and Bolin. Outside these areas, on some nights the band would really steam through 'Come Taste' highlights, only to lose the thread a couple of shows later. The band crashed to a halt at the end of the UK tour, following a traumatic show at the Liverpool Empire on March 15th 1976. Coverdale had already resigned and asked Micky Moody to work with him after a disastrous Wembley performance three days before. Lord and Paice also realised that Deep Purple's eight year adventure had come to a close, and had begun planning their next venture, Paice, Ashton, Lord. The only people who weren't officially told about the split were Glenn and Tommy. After two years of solo projects, David Coverdale put together Whitesnake in early 1978, enrolling both Lord and Paice into its ranks by mid 1979. Tommy Bolin died on December 4th 1976 from multiple drug intoxication, leaving behind a rich legacy of work that still entrances new fans. Glenn Hughes cut a solo album, did some sessions and almost disappeared off the horizon. He eventually emerged from his drug dependency, getting his career back on track in the early 1990s. As soon as Deep Purple split in 1976 the band quickly achieved a mythical status. 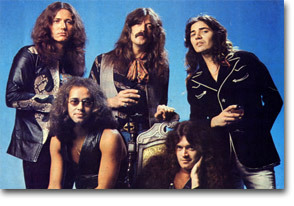 Their huge reputation was fully reinstated and continued to grow, aided by the success of the 'split groups' Rainbow (featuring Ritchie Blackmore and from 1979 Roger Glover), Whitesnake and Gillan in the late seventies and early eighties, as well as a judicious selection of fan-driven archive releases and varied record company compilations. Talk of a reunion never went away, and just when it seemed that the best windows of opportunity had passed, the most celebrated line-up, Mk 2, announced its full return in April 1984. The one and only Mk4 studio album. 8 out of 10 tracks were co-written by Tommy Bolin. Remastered in 2011 with bonus tracks. In addition to the 'Days May Come..' rehearsals double set, Purple Records also made available a mail order only bonus CD called '1420 Beachwood Drive' containing further Pirate Sound rehearsal tracks which hadn't made the cut for the main release. Both sets were combined as a double album under the 'Days May Come..' title in 2008. 'Come Taste The Band' is being remixed for a 2010 release. Very little Mk 4 footage has been unearthed. The 2009 'History Hits & Highlights' collection includes two tracks from a film of the December 1975 Tokyo show ('Rises Over Japan'), and a twenty minute New Zealand TV documentary from 1975 which does not include live footage with sound. A short live clip (with the sound from a Mk 3 studio track dubbed on!) thought to originate from a show in Hawaii, 1975 appeared in 1991 on the very poor 'Heavy Metal Pioneers' hour long biographical video, which has been rereleased on dvd without any extra footage. A 30 minute film of the December 1975 Tokyo show was prepared for release in 1985 but withdrawn at the last minute.